Sun and fun in Brussels? Yes it's not the boring EU centre of its reputation. Saturday courtesy of we are social I was part of a group invited on a Eurostar little break, big difference trip to Brussels. Our full on day began with an incredibly interesting guided tour of the Margritte Museum followed by a Peruvian BBq on Bruxelles les Bains ha you don't have that on Paris Plage. I'm betting there was a great party later on. Some of us took to the streets to see the amazing street art. London artists get spraying you've got huge competition here. Stumbled on a small beer festival where we tried Bremers beer and I manged to convince the boys to try snails. All except one and now he wishes he had. You'll just have to go back. Locals told me there is also a festival not to be missed in September. We got a glimpse of the square and the amazing buildings before we raced off to a beer tasting. Cherry beer, that was a first for me. We sampled local sausage, cheese and of course mussels. The day flew by so quickly, so much to do. I feel a wee break coming up soon. Alex David Gordon Katherine Lux and Jourik Mark and Tom Mehrdad Radim Sarah Violette and Medina. LOL That's actually one of my favorite garden statues over here in Canada, I don't think there's a single gardening center of consequence in the city that doesn't sell a fountain topped with that little fella. Great capture and the other photos you took on your trip are great too! Sounds like a fun time. Looks like a long line at the W.C.
What a great trip...food, recreation and art. I'd love to see the Magritte museum! LOL,that is a cool pic! Bruxelles is a beautiful city ! That first photo is a riot! What a great time you had! Thanks so much for coming by The Villages DP! I'm so glad to have clicked on the links for your friends - especially the first one (Alex). I feel thoroughly refreshed and enlivened by seeing the photos of trucks and cardboard models and the V&A Street Fair (Tiddleywinks!) so I've had extra value from visiting your Brussels post today. That is a funny shot indeed. Love it. Sounds like a great trip. I'll bet the Margritte Museum was incredible. Great pics... love street photos as you probably know! Thanks for visiting my blog. I am enjoying your too. I love traveling and seeing new things. Love the funny photo you chose for this story! Sounds like you had a fabulous day! Hope you can get back soon as you wish. 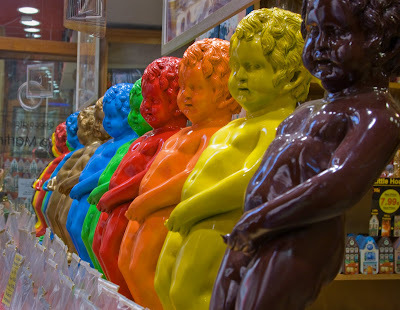 I have the sky blue Manneken Pis, please. Magritte is cool and one of my faves. You crammed a lot in, glad you enjoyed. What do you mean the Empire doesn't exist anymore?! Surely you are joking! I like Brussels - weird food, though. The local seems to really like cows' brains in what looks like mushy peas. Thanks for the link Mo. I've not forgotton about the widget, just have been working solidly! I really want to go there for a beer, too!